Because Amsterdam Canal Guest Apartment is right in the center of Amsterdam, parking is expensive (€ 5,-/hour) and finding a parking spot is not easy at all. The underground Parking Muziektheater/Waterlooplein is only 300 m away from the apartment. This parking cost you about € 4.50/hour and € 45,-/24 hours (about the same you’d have to pay when parking on the street). Much cheaper parking solutions are the Park&Ride’s (see: P+R Amsterdam),. You will pay € 8,-/day including a public transport return ticket for maximum of 5 persons into the city center. On the southeast side, you will find the P&R Arena from which metro 54 brings you directly to the Waterlooplein underground metro stop in 11 minutes. 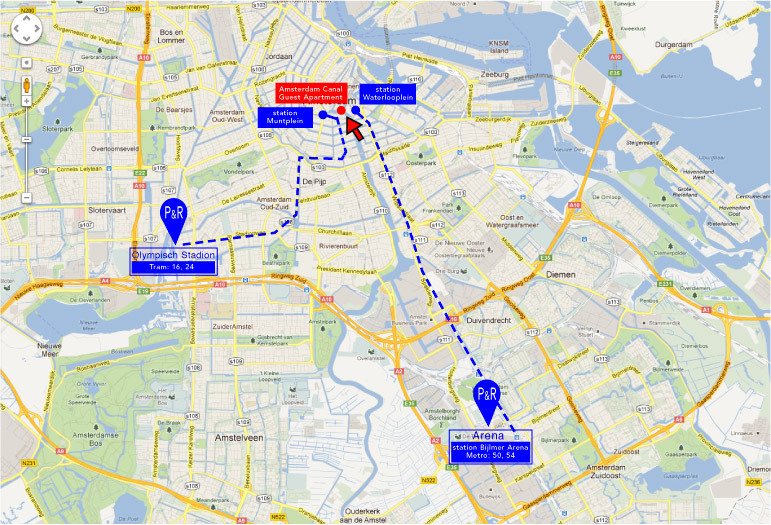 From here it is only a 5 min walk to the Amsterdam Canal Guest Apartment. On the southwest side you will find the P&R Olympisch Stadion from which the tram line 24 will bring you to the Muntplein, from which it is only a 6 min walk to the Amsterdam Canal Guest Apartment at Zwanenburgwal 296.